Where can I Find a Union Jack Chesterfield Sofa? If you are looking to bring traditional British décor element in your living room then Union Jack chesterfield sofas are ideal for you. The modern and contemporary furniture trends have brought this beautiful and unique piece in the market. The Union Jack Chesterfield sofas are symbolic furniture pieces and are made from the finest fabric with a hand finish. Featuring the classic shape and classic tall back, the Union Jack chesterfield sofa stands out from the rest. It has a vivid print and it is distin­gu­is­hable with its non-buttoned feature. Having Union Jack chesterfield sofas in a living room can make the overall décor a bit tricky. However this tricky décor can be made feasible and charming by looking out for range of items that are available in the market. There are range of items in Union Jack pattern that can match this unique chesterfield sofa. You can buy nested tables, lamp shades, mirrors, coasters, treasure chests, rugs, wallpaper, foot stools and even a door mat to create a beautiful homogenous décor in your living room. 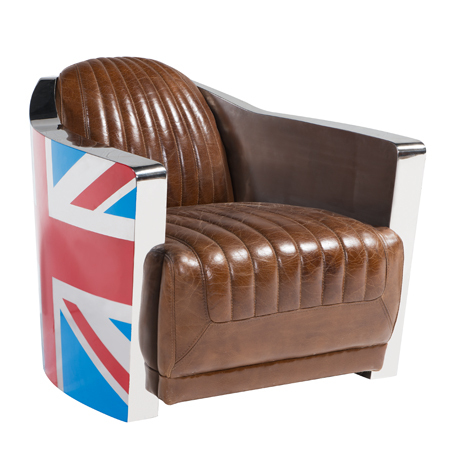 The addition of these pieces with a Union Jack chesterfield sofa depends on the limit of your being a patriot! Do not get carried away by the Union Jack design only but also make sure that the sofa is perfectly symmetrical and has a perfect pattern. Do find out about the material that has been used in making the legs of this sofa as many manufacturers use low quality materials in making of legs. The Union Jack Chesterfield sofas are truly unique and represent the rich history of the entire Chesterfield collection. This sofa has the ability to add a classic to contemporary twist designs in a living room along with exuding the air of style and luxury.